LUX SOUTH ARI is a contemporary family friendly Maldives resort bursting at the seams with fun little touches providing great enjoyment for everyone! We arrived at Easter time and my children loved the huge colourful Easter Eggs placed at the end of the arrivals jetty hinting that LUX South Ari Maldives was going to have a lot of fun surprises in store and that we had definitely arrived a luxurious family friendly resort! We went on to learn that in fact that was one of their signature points of branding, the element of fun and surprise. It starts early each morning when a number of bottles are hidden around the island for guests to find (hint: look at the base of trees!). In each bottle there is a voucher, redeemable on the island. Some prizes we saw other guests find were: free pizzas, evening yacht ride under the stars, LUX signature coffee beans or a spa treatment. Very clever idea! LUX South Ari is a large island and navigation is made easy by complimentary buggies that circle the island all day so you can hop on and hop off as it suits you. There are bicycles for hire too and in addition LUX South Ari also has two motorised scooters available to rent. We were quickly ushered across a beautiful architecturally designed wooden walkway to our two – villas. Recently renovated, the villas were finished in light calming hues of beige and aqua. The bathroom consisted of a walk in shower and separate toilet (with very fancy Japanese style toilet seat with a myriad of buttons that did goodness knows what! We didn’t press many!!). The whole feel of the villa was very modern with artistic features such as a freestanding stone basin and the water flows into it via overhead bamboo pipes. Guests are provided with thongs/flip-flops (that print LUX in the sand as you walk!!) and a practical beach bag for use during stay and we used both of ours every day. Much to the delight of the children there was a recessed home theatre projector and screen that at the touch of a button seamlessly lowered so you could watch a movie (from the enormous complimentary movie collection or even from your own iphone/ipad) right from your bed on the big screen! The beds, I should mention, were really comfortable with plenty of pillows and a convenient USB port on each side of the bed. In keeping with the contemporary vibe there was a white wicker hanging daybed on our balcony and a refreshing wet-edge plunge pool (complete with shade protection from the fantastically warm Maldivian sun) and adjacent wooden stairs leading down in to the crystal clear, warm Indian Ocean. LUX South Ari has 11 bars and restaurants to choose from and we managed to get to them all! Our favourite spot for lunch was the picturesque Lagoon Bar. Set on the beachfront with the serene turquoise lagoon sprawled out in front of you, the lagoon comes complete with inflatable swans and paddle boards so the children could play in the water while they waited for us to call them when their lunch had arrived. Afternoon drinks were a easy decision at Bar Rouge, a contemporary all white bar with vibrant splashes of red that come to life with glowing LED lights as the sun set. A fantastic live DJ was on hand to play relaxed tunes every afternoon as the magnificent sun lowered down to the horizon and then slipped into the Indian Ocean right behind the DJ turntables. Our favourite place to eat was East Market, an asian inspired buffet which had the most extensive choice of all kinds of authentic Asian food on offer and prepared to the highest standard – we always started with the Thai “food cart” style stand and ordered a steaming hot-pot soup and added all the extra condiments in on offer….sooo good! For a special occasion meal you can’t go past Allegra, a classy Italian restaurant with indoor and outdoor tables and elegant presentation and service. There are fun theatrics includes in the meal service e.g. our soup order was dramatically poured into the bowl in front of us at the table. Meal service starts with Amuse Bouche and we ended with a Limoncello! Perfecto! Mixe restaurant served fabulous buffets whether for breakfast or dinner. The children loved the many flavours of gelato they could select, yes, even for breakfast! The restaurant has a machine to grind peanuts on the spot so you can have freshly made peanut butter with your toast! Sensis is a fantastic Indian and Middle Eastern restaurant where our eyes were bigger than our bellies and we could not finish everything despite trying very hard to! It has high ceilings and has an airy island-chic feel and overlooks the beach and one of the infinity pools. I’m vegetarian so this restaurant was heavenly to me with fragrant dhal curries and hommous, tabbouleh and falafel all cooked to perfection and served with a myriad of delicious accompaniments. At Easter time LUX South Ari had a lot of organised activities for children in addition many events designed for whole family participation – which is great for getting the kids outside and off technology. We enjoyed the Beach Olympics as a family (yes Mums and Dad competed too!) as well as the Junk Art Studio competition where we painted delicate Easter Eggs and took out the winning prize! Our Mr 5 really enjoyed the kids club and asked to go each day. The kids club has a wading pool with pirate ship and fountain along with a great arts and craft space, movie theatre and sleeping room. Our Mr 10 also loved kids club and the teen club Studio 17 which had a ping-pong table, video games and activities to keep busy teens amused when they need a break from the sun. Another fun little touch at LUX South Ari was the towel animals created by staff in the morning and at turn-down service and our children took great delight in rushing back to our room to see the latest towel creation each day! Kids young and old will love ICE. ICE is a quaint little gelato-store on the beach serving so many artisan flavours of gelato and sorbet and in addition there is a portable ICE cart attached to a bicycle and is ridden around the resort at 11am and 3pm with four flavours of gelato. All gelato is made on-site with many artesian flavours such as pumpkin and green tea as well as all the usual winning flavours like mango, white chocolate and chocolate mint. The gym at LUX South Ari is compact but well equipped with treadmill, cross trainer, bike, free weights, punching bag and yoga mats. It opens at 6am for the early birds who like to start their day with some fitness training. The local snorkel tour was great, very clear water with lots of fish and the odd turtle, then you can jump off the roof of the boat into crystal clear deep water. Water sports – LUX South Ari has the only jet surf in Maldives, which is a powered surfboard with a handle, perfect for thrill seekers! LUX South Ari is privileged to have year round whale sharks and manta rays close by to the resort but sighting are becoming more rare. Book bikes before you arrive as they can run out of bicycles in peak periods and they are a fun way to get around the island. Get up early to look for the Message In A Bottle – if you wake by 6.30am and start looking by 6.50am you have a good chance of finding one. Located in the South Ari Atoll we caught a Trans Maldivian Airways seaplane for the 30 minute scenic transfer. 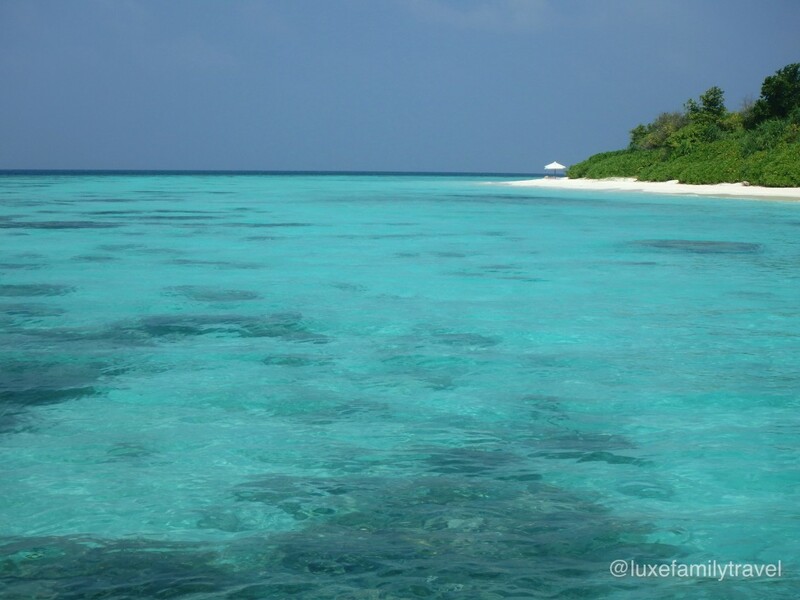 Just email info@luxefamilytravel.com.au and we can help design a wonderful holiday for you. 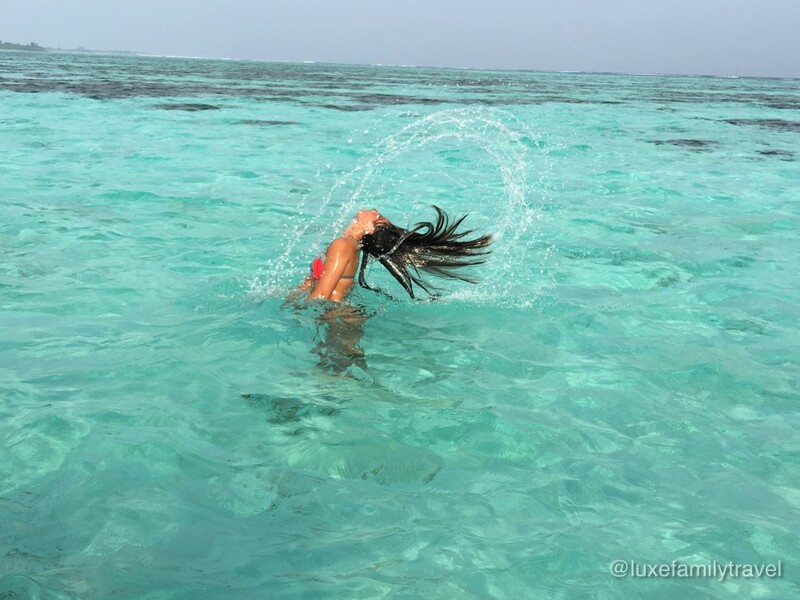 Have you been to LUX South Ari? What did you love? If not ask me more about it in the comments – I’d be happy to help answer questions.